Stitches involve sewing together sections of skin that have been separated because of injury or surgery. This procedure is necessary to facilitate the proper healing of wounds and to prevent infections. However, wounds that are stitched often scar as they heal, leaving irregular, discolored marks on the surface of the skin. Although not all scars are preventable, you can take steps to minimize scar tissue and improve the appearance of your skin. Keep the stitched area covered. According to Karyn Repinski, contributor to the Fitness magazine website, keeping a wound uncovered can double healing time. Cover the entire wound with an occlusive bandage, which is a gauze or cotton dressing that absorbs moisture and protects the wound against infection, according to CureHunter.com. Avoid using hydrogen peroxide to cleanse the stitched area. While many people think that hydrogen peroxide is good for wound treatment, it destroys new skin cells that form during the beginning of the healing process, notes Repinski. Proper skin cell growth is essential for minimizing scar tissue. Apply an antibiotic ointment to the stitched wound for the first week, advises Repinski. 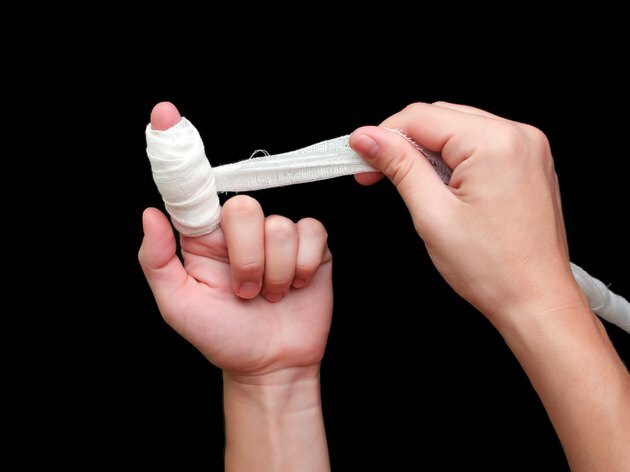 Combined with occlusive bandaging, this will help prevent bacterial infections that impede proper healing. After the first week, switch to petroleum jelly to facilitate continued new skin growth. Apply vitamin E oil to the skin's surface after your doctor has removed the stitches and the wound has healed. According to Dr. James F. Balch, author of "Prescription for Nutritional Healing," vitamin E oil is a powerful antioxidant that can prevent free radical molecules from attacking the skin tissue at the wound site, which may worsen scarring. Vitamin E oil is also thought to stimulate the growth of healthy skin cells, reducing the need for collagen, the primary component of scar tissue. Avoid exposing the wound to the sun's ultraviolet rays, advises Repinski. The sun's rays slow healing and may activate melanocytes, which are pigmentation agents that can discolor the healing skin at the wound site. Keep the area covered with clothing or a sunscreen that has a rating of SPF 15 or higher. Massage the wound site for 15 to 30 seconds three times a day after it has completely healed. According to Repinski, this may help break down collagen tissue, which can contribute to smoother skin and reduce the appearance of scar tissue. Check with your doctor periodically to make sure the stitched area is healing properly. Your doctor will look for signs of infection or other problems that can worsen scarring. Although many medical professionals believe that vitamin E is effective for healing scars and keeping skin healthy, others disagree. A University of Miami study suggested that vitamin E may actually impair wound healing, notes Repinski. Vitamin E may also cause allergic reactions. How Does Mederma Work on the Skin?